ENJOY Robbie’s informative material…and the beauty of Shabbat and challah baking! BONUS Here is Robbie’s delicious, tried-and-true challah recipe for your convenience. Dassie is one of my nieces. I’ve been using her challah recipe for at least 18-years! So it’s proven and true. When my husband and I spent a few years living in a little hut in Lesotho, Africa, I was even able to bake this recipe there. Now it’s a special joy to be baking challah for Shabbat in Jerusalem, where it receives an added fragrance and flavour! 1. Into a large plastic or glass bowl place 4 cups of flour. 2. Add the liquid ingredients and mix well. 3. Add the remaining three cups of flour one cup at a time mixing well each time. 4. When all the flour has been added, turn out onto your workspace and knead until the flour is well integrated. It will be sticky, just put flour on your hands if necessary, but don’t add more flour to the mixture. 5. Lightly oil the bowl and return the dough to the bowl, cover with a tea towel and leave in a warm place until doubled (usually one hour). 6. Punch down and divide for braiding (this makes two large challot or three medium sized loaves). 7. Braid the loaves and then place into prepared loaf pans (greased and floured) or if two large loaves, onto a greased and floured cookie sheet. 8. Allow to rise again for about 30 minutes. 9. Brush tops with 1 beaten egg; sprinkle with sesame seeds. 10. Bake for 30 minutes at 350/180 degrees. Wonderful. Thanks so much for sharing this recipe!!! Jenny, I’ve tasted many of Robbie’s challot and they are truly delicious. Thank you! 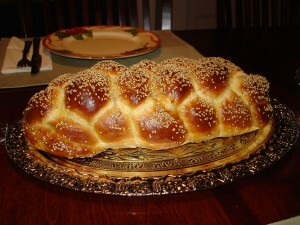 I made “Dassie’s Challah ” this past Shabbat! It was delicious!